A stroll through the streets in the historic centre of Selva, Santa Cristina and Ortisei to admire the wooden sculptures displayed in the craft shops and known throughout the world for their beauty. Discover the towns of Val Gardena: If you wish to combine a visit to Selva di Val Gardena, Ortisei and Santa Cristina with a walk or bike ride, you can follow the path along the old railway tracks. The 10 km path takes about 6 hours by foot round trip. Sellaronda: If you prefer travelling on two wheels and are in shape, we recommend challenging yourself to the Sellaronda Tour, a bike path that crosses the four Dolomite passes: Gardena, Campolongo, Pordoi and Sella. If you wish to play it safe and without encountering any cars along the way, on Sellaronda Bike Day the paths are closed to traffic. Alpe di Siusi with 60 km of downhill slopes and numerous opportunities for cross-country skiing. If that's not enough for you, Val Gardena is part of the Dolomiti Superski area. With a single ski pass you will have access to over 1200 km of ski slopes throughout South Tyrol. 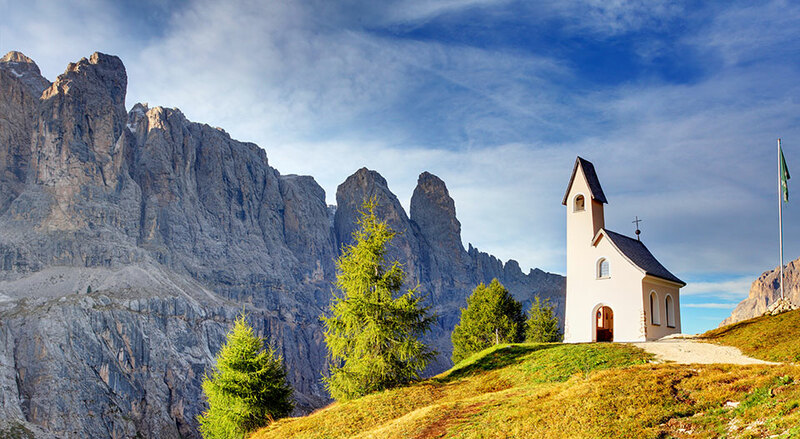 Discover Val Gardena; choose a campsite in South Tyrol.